Adobe just announced that they are slating the Flash player for a 2020 execution. This official confirmation of an unofficial consensus firmly hammers the last nail in the coffin of the Flash era of video streaming. Hate it or love it, no one can deny its impact on the Web today. At one point, it was arguably the most downloaded and widely distributed piece of software in the world, and its impact has been felt everywhere we look. Understandably, many are gleefully dancing on its grave, but our company looks back at what Flash to use to be with a bit of nostalgia. After-all, we got our start by being the first to reverse engineer its streaming protocol, making RTMP live streaming accessible to anyone through our open source Red5 project. We also remember an incredibly creative time for revolutionary ideas that shaped the Web into what it is today. Without Flash, we more than likely wouldn’t have low-latency video communication through WebRTC, nor would Internet video protocols like HLS and MPEG-DASH be so prevalent. I mean, we might not even have the <video/> tag. Without Flash, it’s certainly possible that we would have moved beyond simple image and text based experiences (probably without that distinctive animation style), but it certainly had its place in accelerating it. Craig Swann wrote an excellent post detailing both the innovative advancements, as well as the surrounding culture and community that built things with Flash. The Flash coalition back in its heyday was a group of tinkerers, hackers, artists, and extremely collaborative people who saw the possibilities in a tool originally designed for simple animations on the Web. We are proud to have been a part of that, and we strive to carry on that community legacy, and enterprising spirit. Even as we write this eulogy, the wake progresses. Flash, enshrined in a crypt of circuit boards, passes over into the Trash bin. 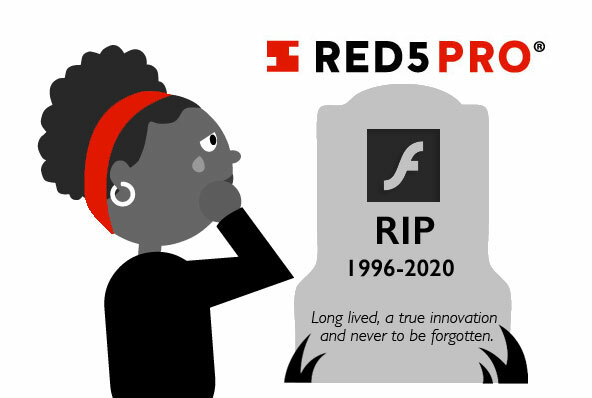 With a dirge to the memory of early Flash pioneers, we shed a tear as we remember their efforts. Through them, they made the internet into the Internet. However, this parting is but bittersweet as we know that with each aging technology comes new opportunity. Now that Flash is gone, you may be looking to replace your low latency video application. Our WebRTC integration is just the answer you have been looking for. For everything else (on a development side that is), Mozilla has this handy migration guide. Let us toast to the future and hope for the continuation of innovation.